Gustave Moreau (1826–1898), The Chariot of Apollo, or Phoebus Apollo (c 1880), oil on canvas, 55.5 x 44.5 cm, Private collection. Wikimedia Commons. The 1876 Salon was the watershed in Gustave Moreau’s art. In four paintings, of which two featured Salome, he had re-established himself as one of the leading artists of the day. His next major focus was the Exposition Universelle of 1878, which was France’s demonstration to the world that it had renewed after the disastrous Franco-Prussian War. From his previous works, Hercules and the Lernean Hydra, Salome, and The Apparition were all chosen for Moreau’s prominent appearance there. So too were three new paintings: The Infant Moses, Jacob and the Angel, and King David, forming a cycle on the ages of mankind, times of the day, and contemporary French politics. Gustave Moreau (1826–1898), Moïse Exposé sur le Nil (The Infant Moses) (c 1876-78), oil on canvas, 185 x 136.2 cm, Harvard Art Museums/Fogg Museum (Bequest of Grenville L. Winthrop), Cambridge, MA. Courtesy of Harvard Art Museums, via Wikimedia Commons. 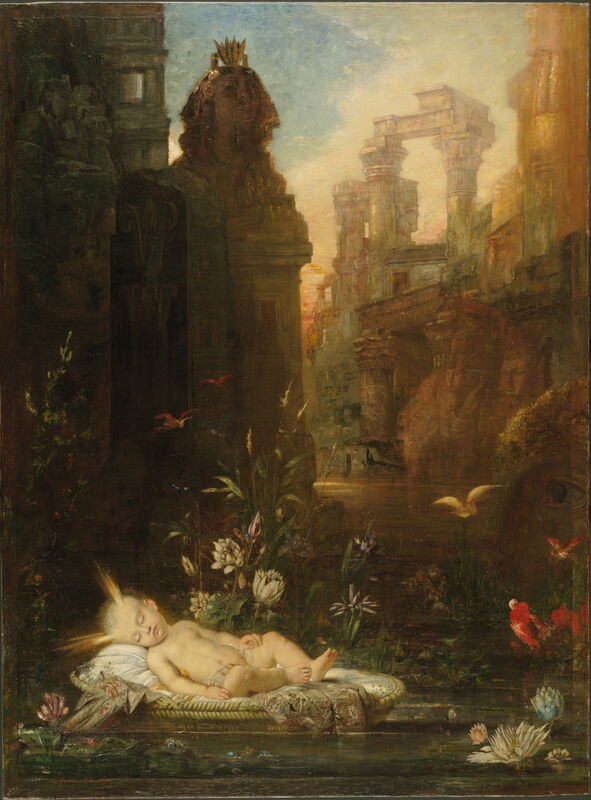 Infancy and dawn were represented by Moïse Exposé sur le Nil (The Infant Moses) (c 1876-78), a radiantly beautiful depiction of the infant Moses asleep, prior to his discovery in the bullrushes. Moses is new life, new Judaeo-Christian beliefs, new law, and the new regime. Set against a background – derived from photographs of Egyptian ruins – symbolising the ancient, pre-Jewish, and decaying – it laid out Moreau’s hope for the French nation. The baby Moses is marked out as being holy by the rays emanating from his temples, and surrounded by exotic flowers and birds. Most unusually, Moreau does not show the traditional and popular moment of discovery of the infant in the bullrushes, but the static scene before. 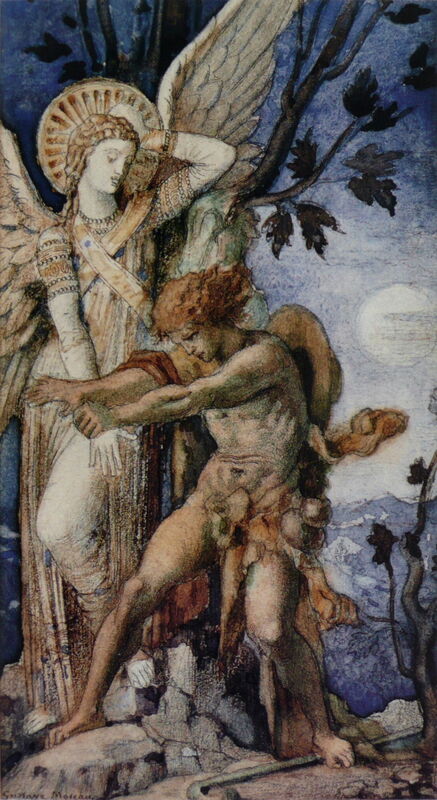 Gustave Moreau (1826–1898), Jacob and the Angel (c 1874), watercolour on laid paper, 18.5 × 10 cm, Musée National Gustave-Moreau, Paris. Wikimedia Commons. These three paintings did not suddenly emerge from Moreau’s mind onto the canvas. For example, Jacob and the Angel is a watercolour study which he made around 1874 for the second in the cycle, showing maturity, night, and the ceaseless struggle both spiritual and political. And he rose up that night, and took his two wives, and his two womenservants, and his eleven sons, and passed over the ford Jabbok. And he took them, and sent them over the brook, and sent over that he had. And he said, “Thy name shall be called no more Jacob, but Israel: for as a prince hast thou power with God and with men, and hast prevailed.” And Jacob asked him, and said, “Tell me, I pray thee, thy name.” And he said, “Wherefore is it that thou dost ask after my name?” And he blessed him there. And Jacob called the name of the place Peniel: for I have seen God face to face, and my life is preserved. And as he passed over Penuel the sun rose upon him, and he halted upon his thigh. 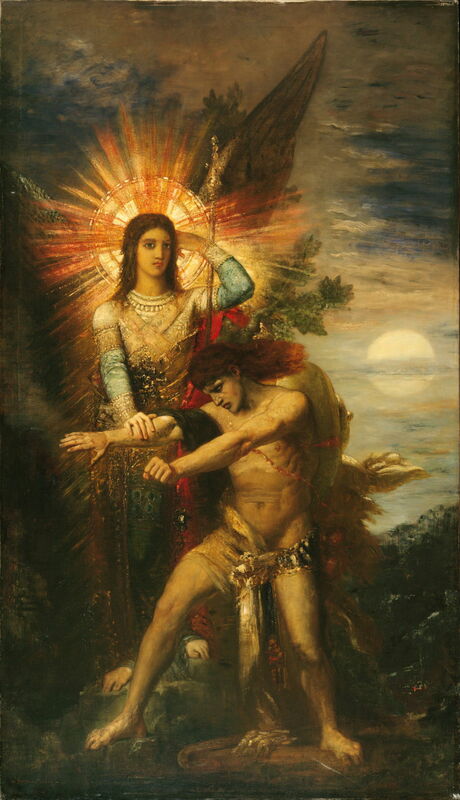 Gustave Moreau (1826–1898), Jacob and the Angel (1874-78), oil on canvas, 254.7 x 145.3 cm cm, Harvard Art Museums/Fogg Museum (Bequest of Grenville L. Winthrop), Cambridge, MA. Courtesy of Harvard Art Museums, via Wikimedia Commons. Jacob and the Angel (1874-78) is the finished oil painting shown in the Exposition, and shows the young Jacob wrestling heroically with the invisible power that is God, the angel standing nonchalantly by. 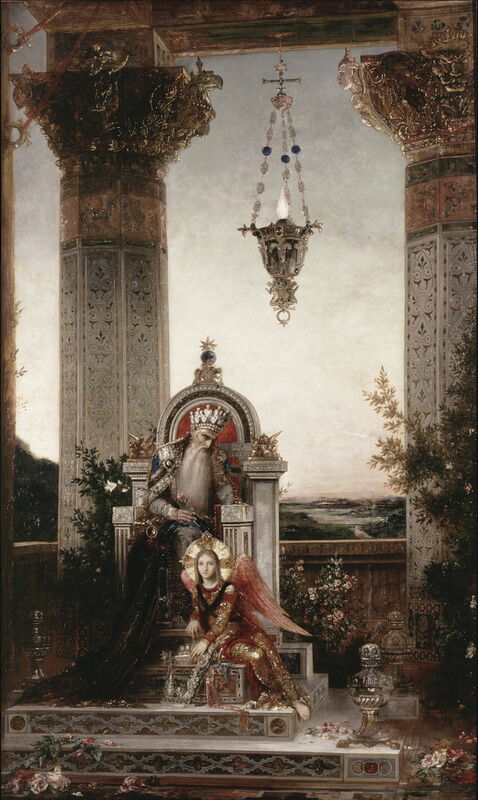 The third painting, King David (1878), symbolises old age, the evening, and the experience of a wise tradition, both spiritually and politically. Moreau’s textual reference was not the Psalms of David, but according to Cooke it was Joseph de Maistre’s Les Soirées de Saint Petersbourg of 1821. Joseph-Marie, comte de Maistre (1753-1821) was a staunchly conservative Savoyard writer and philosopher; this Platonic dialogue of his was published posthumously, and devoted no less than fifteen pages to his eulogy of the Psalms. The elderly David the King sits on his throne, an angel at his feet. An ornate oil lamp has already been lit as the twilight starts to fade into the evening. There are rich symbols embedded in the ornate decor, including a set of symbols of the four evangelists, taken from a Byzantine book cover, which appear on the capitals (atop the pillars): these are an eagle, angel, lion, and ox (also used by William Blake, for example). According to Moreau, David is here engaged in contemplating his “faults and crimes” in an act of expiation, just as he did in various of his Psalms. The angel has gathered up David’s famous harp, and represents his soul and personifies his poetry. Unfortunately these elaborate symbols were lost on Moreau’s critics, who, although full of admiration for the painting, failed to read its mediaeval signs. Moreau had a total of eleven paintings selected for the Exposition in 1878. Another of those – this time a magnificent watercolour – was his The Fall of Phaeton (1878). 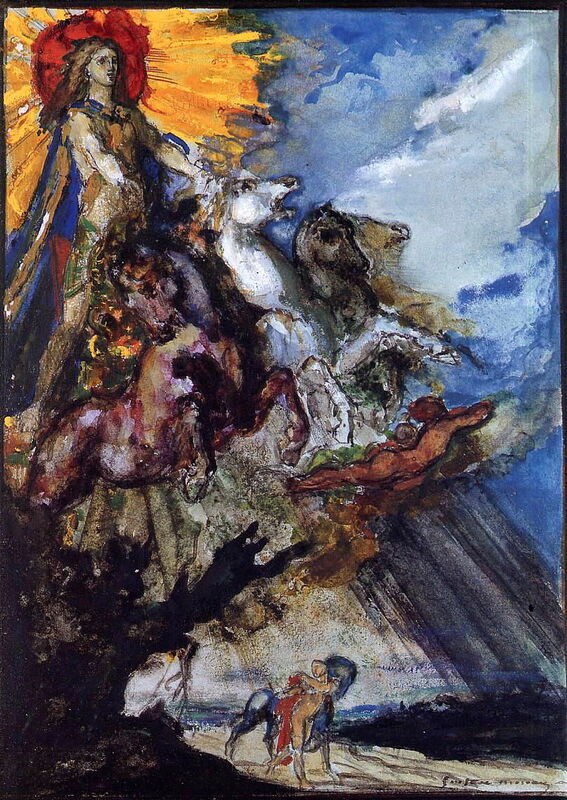 Gustave Moreau (1826–1898), The Fall of Phaeton (1878), watercolor, highlight and pencil on paper, 99 x 65 cm, Musée du Louvre, Paris. Wikimedia Commons. This refers to the classical myth involving Apollo, the sun god, and his son Phaethon. As the god of the sun, Apollo drove its chariot across the heavens each day. His son Phaethon was challenged by his peers to prove this. When Phaethon asked his father, he promised to grant his son whatever he wanted in proof. Phaethon asked to drive the sun chariot for a day, and despite Apollo’s concerns, did so. Once Phaethon was in charge of the chariot, he lost control of the horses, and Zeus had to kill him with a thunderbolt to prevent the chariot from crashing to earth and burning it up. 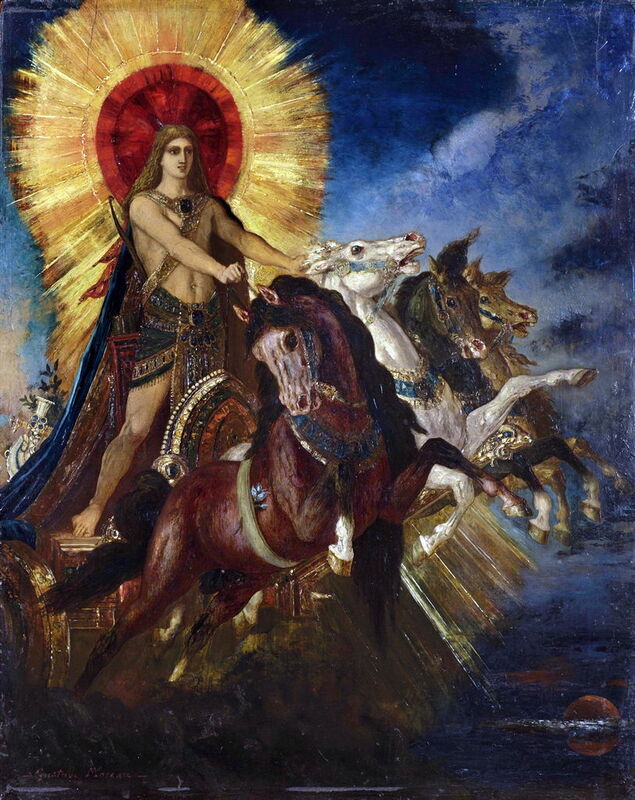 Moreau’s painting shows the sun chariot just about to crash to the ground, Phaethon in distress, standing in the chariot itself, and the horses in total disarray. Apollo, shown in one of his representations as a lion, pursues the chariot in alarm, and a huge serpentine basilisk or dragon rises up from the earth. At the left the moon is shown just peeping over the horizon, and the thunderbolt from Zeus is flying down to kill Phaethon. 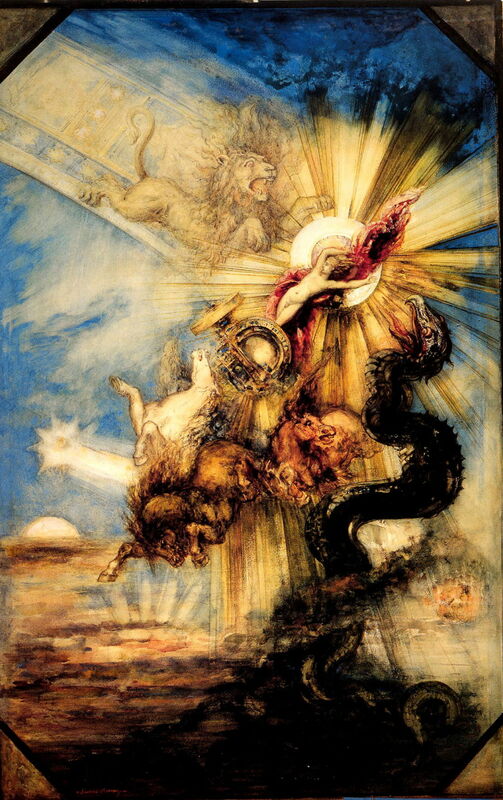 This is probably the most action-packed narrative painting in the whole of Moreau’s works, and was the start of a short series of paintings which examined classical myths about the sun. Gustave Moreau (1826–1898), Phoebus and Boreas (1879), further details not known. Wikimedia Commons. Phoebus and Boreas (1879) is a sketch showing Phoebus Apollo in his sun chariot at the left, and Boreas, the cold north wind, to the right of centre. This results in the cold, windy and changeable weather typical of the winter, as shown in the clouds. The Chariot of Apollo, or Phoebus Apollo (c 1880) is a finished version probably derived from that, just showing Apollo driving his sun chariot. Gustave Moreau (1826–1898), Salome in the Garden (1878), watercolour on paper, dimensions not known, Private collection. Wikimedia Commons. 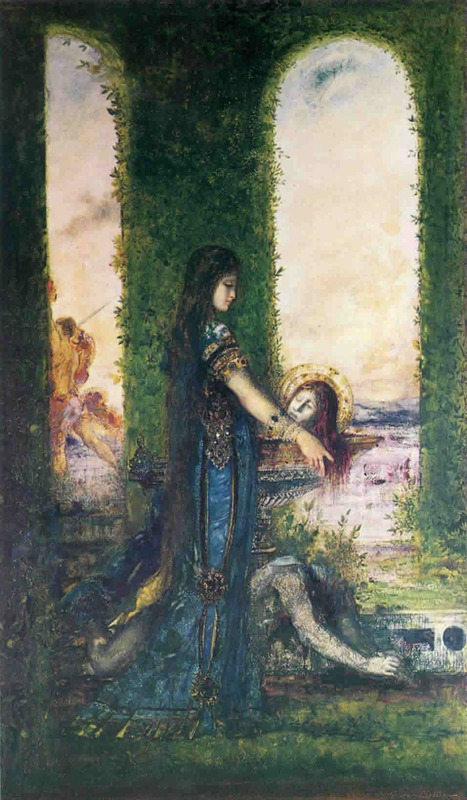 Moreau also revisited his new myth of Salome and John the Baptist, in his strange watercolour of Salome in the Garden (1878). A beautiful and decorated figure of Salome is walking in an overgrown garden, carrying the severed head of John the Baptist on a large platter. Her eyes are closed, or perhaps looking down at the head, and John’s eyes are closed. Beside her is a headless statue of a man crawling, which could perhaps be the body of John, and outside is a man, possibly the executioner waving his sword. This was also shown in the Exposition, but lacks the power of the two other works featuring Salome which were shown there, and possibly only led to confusion as to its reading. Gustave Moreau (1826–1898), Hercules and the Stymphalian Birds (c 1872), oil on panel, 17.8 x 29.2 cm, Frances Lehman Loeb Art Center, New York, NY. Wikimedia Commons. Over this period, Moreau was also working on the depiction of the sixth labour of Hercules, in which he dispersed the man-eating birds of Lake Stymphalia in Arcadia. That started with his Hercules and the Stymphalian Birds in about 1872. According to the myth, the Stymphalian birds had beaks of bronze and metallic feathers which functioned as arrows. They had migrated to Lake Stymphalia, where they took over the countryside, destroying the inhabitants, their fruit and crops, and leaving their toxic droppings to poison the land. The lake had become a swamp, which could not bear Hercules’ weight, so Athena assisted him with a rattle which scared the birds into the air. Once in flight, he was able to shoot them down with his arrows, and the few survivors then fled. 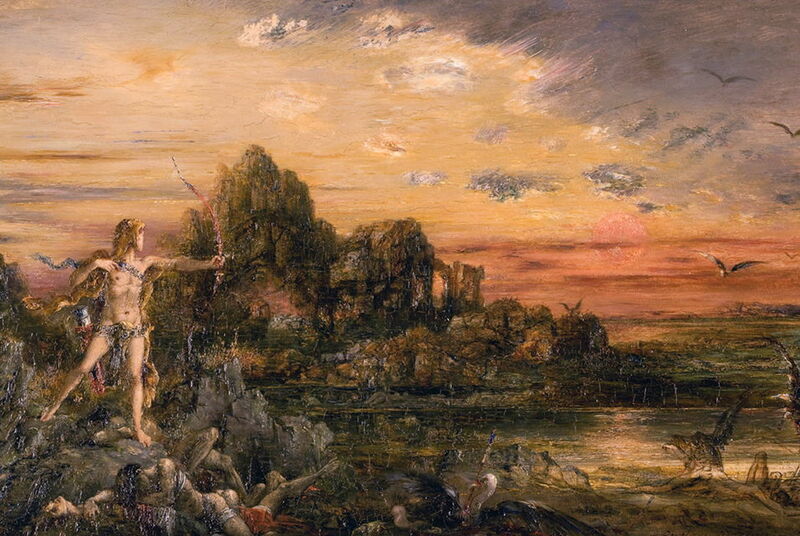 Here Moreau shows Hercules shooting his arrows at the birds, with some dead birds and several human corpses in the lake. Gustave Moreau (1826–1898), Hercules at Lake Stymphalos (c 1875-80), oil on canvas, dimensions not known, Musée National Gustave-Moreau, Paris. Wikimedia Commons. 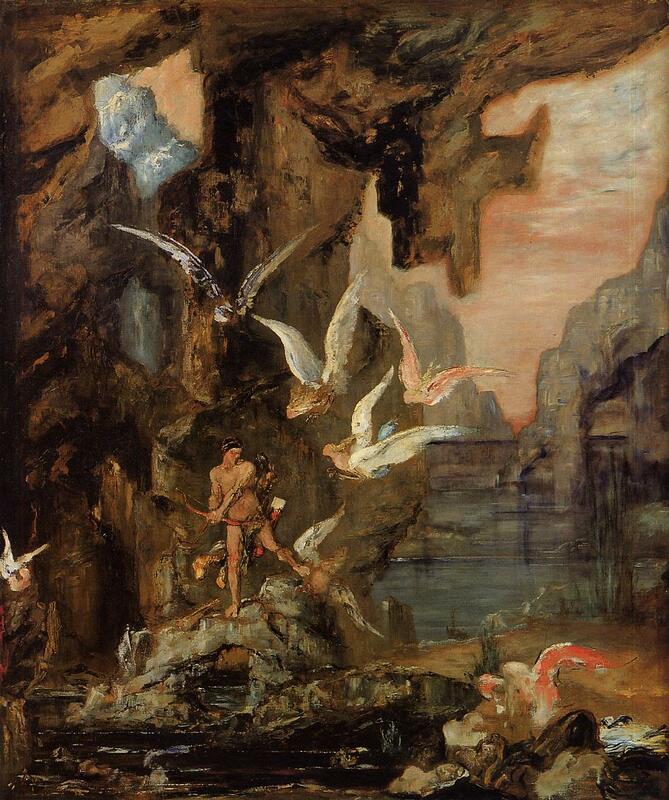 This later study or incomplete painting, Hercules at Lake Stymphalos (c 1875-80), places the scene in a gorge, and the birds here have human heads and chests. Following Moreau’s success at the Salon in 1876 and his strong showing at the Exposition two years later, he was commissioned to paint a large series of watercolours illustrating the fables of La Fontaine for the very rich Antoni Roux. These remain in a private collection and are only accessible as a handful of engravings, which are hardly fair reflections of Moreau’s originals. Much of the painter’s time from 1879 to 1884 was occupied with the more than sixty paintings that he contributed to the series. He still found time to exhibit at the Salon in 1880, which I will consider in the next article in this series. Posted in General, Painting and tagged history, Moreau, myth, narrative, painting, Salome, symbolism. Bookmark the permalink.